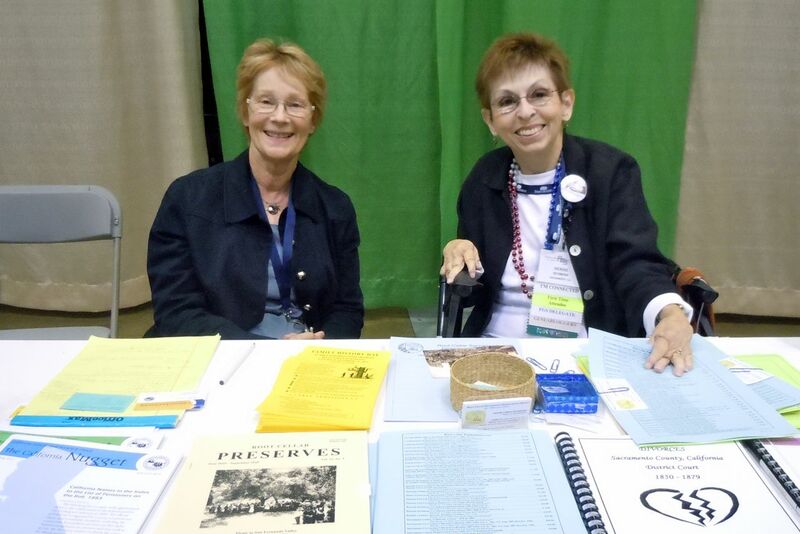 The California Genealogical Society sponsored a table recently at the Federation of Genealogical Societies (FGS) annual conference in Springfield, Illinois. 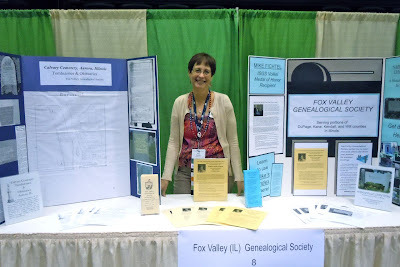 FGS made it easy for even distant genealogy societies to have a presence in the exhibit hall at Society Showcase on Thursday, September 8, 2011, in the Prairie Capital Convention Center. Exhibitors were encouraged to "bring display items and giveaways, such as membership brochures, sample publications, bookmarks, and event fliers." 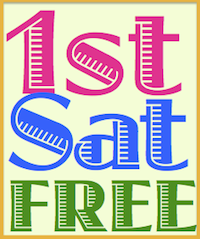 The FGS Conference blog published the full list of participating societies. 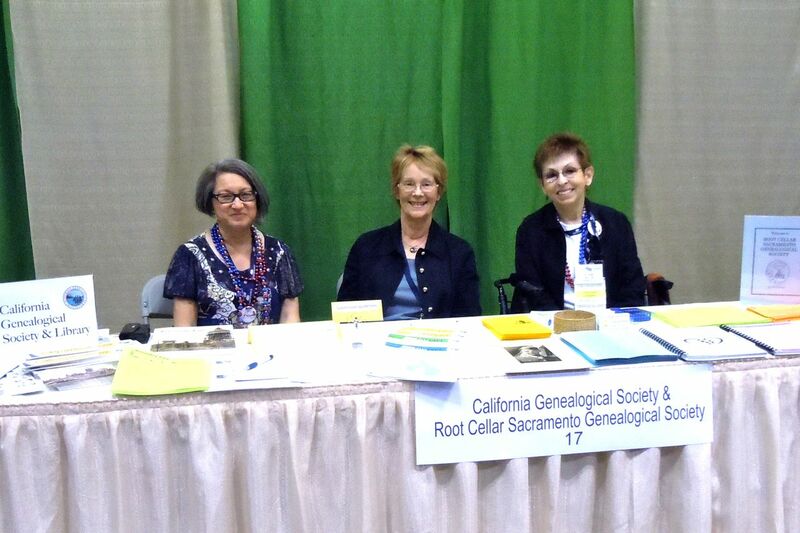 California Nugget Editor Jane Hufft and I staffed the table which we shared with fellow CGS member Denise Richmond who was representing the RootCellar Sacramento Genealogical Society. Denise handles publicity for RootCellar and she is one of the authors of the excellent Root Cellar Sacramento Genealogical Society Blog with teammates Sandra Gardner Benward and Ron Setzer. Denise is also the blogger behind the conference blog for the upcoming Family History Day at the California State Archives on Saturday, October 15, 2011. We had lots of information fliers and brochures highlighting the best of our California societies. Both Denise and I took advantage of the U.S. Post Office flat rate boxes to mail materials ahead of our arrival. Jane brought sample copies of our periodical as well as her submission guidelines for the Nugget. I think she talked to at least two potential authors who were intrigued with the idea of writing about their California ancestors. Staffing the next table over and representing Fox Valley Illinois Genealogical Society was their president, Jane Haldeman, co-owner of It's Relative. Jane and I "met" years ago via a Rootweb mail list and exchanged information about our BRIGGS of Huntingdon County, Pennsylvania. It's one of my "brick wall" lines so I'm not exactly sure how Jane and I are related but I'm optimistic that someday I'll figure it out. It was great to finally meet "cousin" Jane in person and to attend one of her lectures. The CGS contingent had one significant meeting that occurred just outside the convention center. 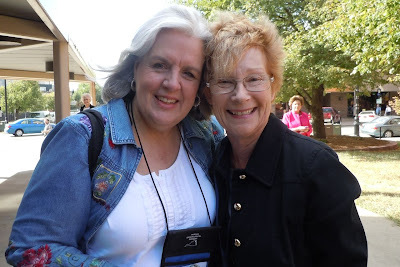 Jane and I ran into DearMyrtle herself – Pat Richley. Jane had been wanting to meet Pat since they share a love of quilting. I'm still not exactly sure how it happened but in just a few minutes a cash transaction had taken place, fabric was exchanged and information was provided about the 1812 Preserve the Pensions Quilt Project. It was a whirlwind few days but CGS was well-represented in Springfield.